As a nonprofit performing arts center, The Englert Theatre averages about 300 events each year, attracting approximately 60,000 patrons to Downtown Iowa City. 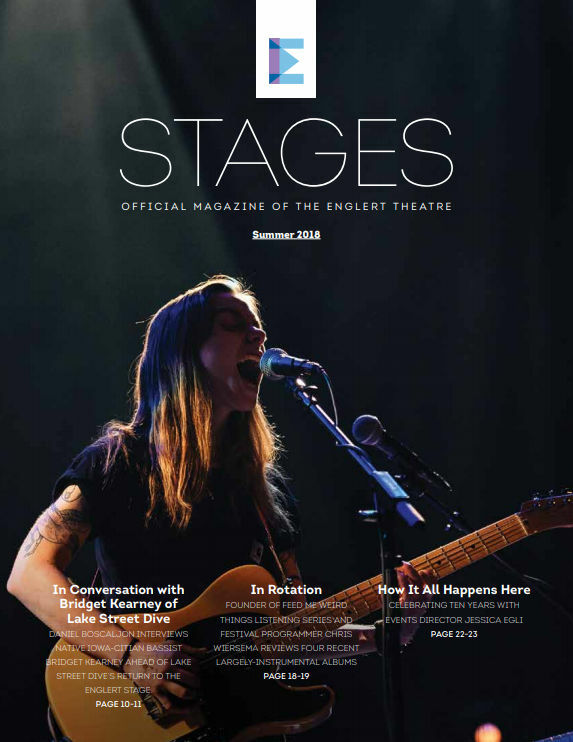 In November of 2014, we replaced our traditional, black and white playbill with Stages, a full-color, magazine-style publication that will better reflect the Englert’s identity as a driver of arts and culture in our community, our region, and beyond. It is a publication of more substance than our traditional playbill, increasing its value for advertisers and providing a platform for us to spark a dialogue with the community. Contact Connor Wade at connor@englert.org or 319-688-2653 x107 for more information. Every copy of Stages marks an opportunity for advertisers to connect with our patrons—people ranging from young professionals to students, families, retirees, and others. The tri-annual publication hits our aisles November, March, and July of each year. A variety of ad sizes and advertorials (customized feature articles written by the Englert marketing staff) are available. Promote your business or organization while showing your support for Iowa City’s last remaining historic theatre and helping us produce quality programming, educational outreach, and community engagement.